LEGENDARY singer Aretha Franklin died today. The music icon, who influenced generations of singers with unforgettable hits such as Respect (1967), Natural Woman (1968) and I Say a Little Prayer (1968) has left an indelible mark on the History of Rock and Roll, Civil Rights, and Women’s Right’s Movements. Franklin cemented her place in American music history with her powerful voice that stretched over four octaves. In her decades-long career, her hits spanned the genres, from soul to R&B, to gospel and pop. She was the first woman to be inducted into the Rock & Roll Hall of Fame in 1987 and in 2010, Rolling Stone magazine put her at the top of its list of the 100 greatest singers of all time, male or female. Growing up in the 1950s, Franklin was surrounded by civil-rights activists from a young age, and spent her trailblazing career supporting those who fought for equality—and setting an example herself as an American success. Franklin was raised primarily by her father, C.L. Franklin, a Baptist minister and a civil-rights activist that organized the 1963 Detroit Walk to Freedom, which was the largest civil-rights demonstration in U.S. history until the March on Washington displaced it two months later. Martin Luther King Jr., a friend of C.L. Franklin’s, delivered an early version of his “I Have a Dream” speech at the Detroit march. In 2016 interview with Franklin, Elle Magazine noted it was written into her contract in the 60s that she would never perform for a segregated audience. Franklin said she was glad that the song became linked to feminist and civil-rights movements. She added that the line “you know I’ve got it” has a direct feminist theme. Aretha Franklin’s lyrics and life story are teaching tools for our students. Whether reading a biography about the Queen of Soul or analyzing her song lyrics, Franklin offers many lessons throughout her music that touch on topics of activism, relationships, and power. Do the lyrics remind you of anything you have learned about concerning the civil right’s movement and or women’s movement in the 1960s? What craft moves and music elements influences in this song? — Possible answers include call-and-response, complex rhythms between different instruments, and/or a Gospel performance style. What elements of music have popular artists today borrowed, modeled, and mentored from Franklin’s music? Go Go Brain is an interactive online platform that strengthens seven critical meta-cognition skills: 1. Listening, 2. Following Directions, 3. Self-Control, 4. Focus and Attention, 6. Working Memory, and 7. Visual-Spatial Reasoning. The website offers games for young people to play to build these skills and flex their brain muscles. As I was playing the games, I thought that this might be great for adults too. For the 2018-2019 school year, GoGo Brain is offering complimentary memberships where parents and teachers can enroll for free by visiting the website and use the code: GoGo2018. Mind Right offers personalized, live coaching over text message for teens who want to talk, judgment free. The company was started by two women who met at Stanford’s joint MBA/MA in Education program. Inspired by personal and familial histories with trauma, Ashley Edwards and Alina Liao have been working to reduce the stigma around mental health in communities of color and ensure every child has access to mental health support. With the growing amount of mental health and anxiety that young people may be feeling today and maybe unable or afraid to talk, Mind Right offers young people guidance from a team of coaches that can help navigate the challenges we face every day – both positive and negative. 826 Digital is a new website for educators with writing curriculum tools including activities, lesson, and student writing. This is a creative writing platforms with Sparks, or flexible and focused skill building activities, as well as ready to use, topic based lesson plans and mini units to help teach process and revision. Some examples include Rewriting the Zombie Apocalypse and Teach a pirate how to eat a peanut and butter jelly sandwich. All of the lessons and projects are Common Core aligned. There are resources to teach persuasive, expository, narrative, poetry, and STEM writing. I cannot wait to use some of these writing prompts with my middle school students. For media literacy, Weird Enough Productions is launching their own comic based media literacy curriculum. With an eye on representation, their mission is to “combat media misrepresentation through original content and media literacy education.” Subscribe on their website now to get early access to their media literacy curriculum. I am so excited for Words Liive, a 21st Century education technology that has developed the Culturally Responsive Pedagogy needed to meet the instructional demands for today’s classrooms. Today’s youth needs to see themselves in their education to aspire to perform in school. They’ve created a patented platform that integrates song lyrics into students’ reading assignments. Founded in 2013 by artist and educator, Sage Salvo, Words Liive is a music-based literacy program that helps teachers and students connect classic canon with contemporary popular music today. Words Liive integrates song lyrics into students’ reading assignments via “Real-Time” and On-demand Culturally Responsive digital platform. Currently in Beta form, you can preview the texts, find lesson plans, and utilize the available assessments. Check it out! In the Common Core Standards, students in fourth grade and higher are expected to “Compare and contrast the treatment of similar themes and topics (e.g., opposition of good and evil) and patterns of events (e.g., the quest) in stories, myths, and traditional literature from different cultures.” This is a lot different from the “find one similarity and two differences” that has been the expectation up to now. 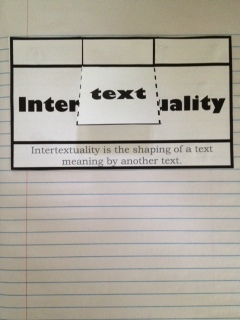 Introduce students to the meaning of intertextuality and provide them with a few examples. First, play for the student the Katy Perry Video Roar and ask the students what the song is about. Ask the students what the line “eye of the tiger” means in Perry’s song and if they have heard the saying before. Tell the students that intertextuality is when a text ‘s meaning (story, book, article, song, video, movie) is influenced by another text. Intertextual references can be subtle or obvious. 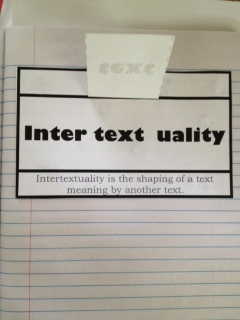 The key idea is that these intertexual references allow for a deeper understanding of the text. Katy Perry’s music is a great example because she references so much music history in her songs – from Radiohead to Johnny Cash. Break students up into small groups and have them look at the lyrics of all three songs to look across the texts for commonalities and reoccurring patterns. Students can share their findings with the large class after 6-8 minutes of small group discussion. We want our students to be able to make connections among texts so they are able to understand the jokes and parody involved with television shows like The Simpsons, Family Guy, and Regular Show. Students also need to decipher intertextuality so they might understand the components across texts and identify bigger themes communicated in the stories we read. 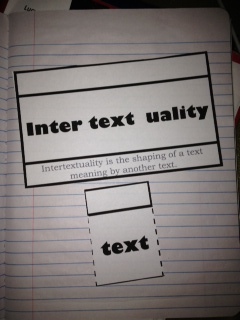 For a copy of the intertextuality interactive notebook file and lesson plan you see in the pictures above click here.